Barbara Euphan Todd (1890-1976) was active as an author of children’s fantasy from as early as 1924, when she produced The ‘Normous Saturday Fairy Book, with Marjory Royce and Moira Meighn. Her greatest achievement, however, was the Worzel Gummidge series, the adventures of a scarecrow, which began with Worzel Gummidge, or The Scarecrow of Scatterbrook in 1936. There were several more in the series, from More About Worzel Gummidge (1938) to Detective Worzel Gummidge (1963). The stories were very popular, especially from the time that the first volume was reprinted by Penguin as the very first Puffin children’s book in 1941. For all the titles, see the Encyclopedia of Fantasy. Todd was born at the vicarage at Arksey, near Doncaster, Yorkshire, the daughter of Thomas Todd, the vicar. She left school in 1914, and during the First World War worked on the land and served as a Voluntary Aid Detachment (VAD) nurse (see War Experiences). After the war she began to make her name as a contributor to Punch, using “Euphan” as her pseudonym. Her poems about children were not only very reminiscent of those of A.A. Milne (another great Punch contributor), but when they were published in two volumes they were illustrated by Ernest Shepard, Milne’s famous illustrator. In 1932 she married Commander John Graham Bower (1886–1940), a retired naval officer. They had no children, but from a previous marriage he had a child, Ursula Graham Bower, who, as Wikipedia puts it, “was one of the pioneer anthropologists in the Naga Hills between 1937–1946 and a guerrilla fighter against the Japanese in Burma from 1942-45”. 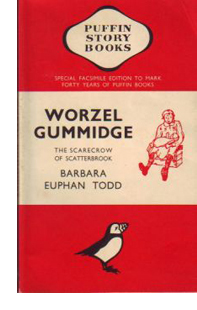 Todd’s Worzel Gummidge, an animated scarecrow, became very popular at an early date, partly because was so different from the standard fantasy figures of 1930s British fiction: he was rude, sulky, and unreliable. He was kind-hearted, though, and had some reassuring catch-phrases, such as “stands to reason”, “ooh aye”, and “humans is daft”. Todd was widowed in 1940, and continued to write, producing her last in 1972. In 1946 she published her only adult novel, Miss Ranskill Comes Home, about a woman who returns to England after being stranded on a desert island during the war; it was republished in 2003 by Persephone Books. Not long after her death, Worzel Gummidge appeared for a second time on British television, between 1978 and 1981, this time with Jon Pertwee as the main figure, bringing her famous creation to a new audience. My information comes from Elizabeth J. Morse’s entry in the Oxford Dictionary of National Biography.